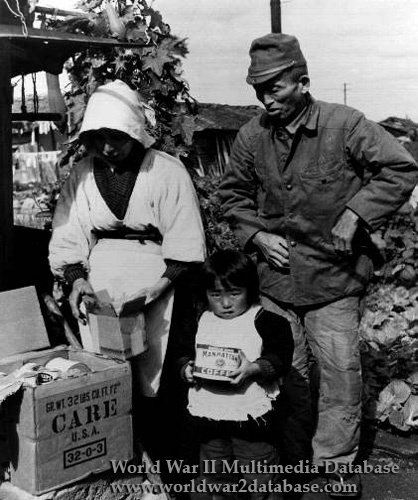 A Japanese family receives their first CARE package to honor CARE's agreement with the Japanese Government. The Cooperative for American Remittances to Europe (CARE) coordinated the distribution of 26 different charities' combined relief aid. At first CARE used surplus food called "10-in-1" rations stockpiled for the invasion of Japan. CARE partnered an American donor with a specific recipient overseas. The parcel contained one pound of beef with broth, one pound of steak and kidneys, 8 ounces of liver loaf, 8 ounces of corned beef, 12 ounces of Spam, 8 ounces of bacon, 2 pounds of margarine, one pound of lard, one pound of fruit preserves, one pound of honey, one pound of raisins, one pound of chocolate, 2 pounds of sugar, 8 ounces of egg powder, 2 pounds of powdered whole milk, and 2 pounds of coffee. Later rations had more culturally appropriate food. CARE also sent packages of soap, cotton cloths, shirts and blankets. Additional resources, such as carpentry tools, agricultural implements, seeds, and construction supplies were also sent, along with teachers to train war survivors vocationally. The packages were sent as parcels via the post office all over Japan.